Want to read more? Visit Mary's related blogs for deeper insights on spirituality, religion, prayer and more. 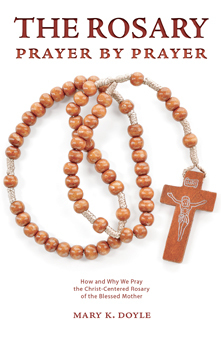 The Rosary Prayer by Prayer by Mary k Doyle is the handbook on praying the rosary. It is the easiest and most inspiring way to pray the rosary for beginners as well as experienced pray-ers. The book includes background information on the rosary and a page by page way to follow the prayers with Scripture, reflections, and extraordinary artwork by artist Joseph Cannella for each of the mysteries. It also contains a wealth of resources to tap into. Whether praying the rosary for the first time, or already praying it daily, readers will find that The Rosary Prayer by Prayer offers an easy and spiritually enriching way to pray the rosary. The prayers and mysteries are presented in this beautiful revised edition in order alongside a diagram of a rosary with the corresponding beads encircled. Four complete rosaries can be prayed page by page; one each with the Joyful, Luminous, Sorrowful, and Glorious Mysteries. Related Scripture verses, insightful reflections, original prayers, and breathtaking artwork by Joseph Cannella accompany each of the mysteries. You also will find the history and benefits of praying the rosary and the meaning and development of the prayers of the rosary. What’s more, there is an appendix full of resources. The Rosary Prayer by Prayer was written in response to a demand for a greater understanding of the rosary and devotion to Mary. When we go to Mary in prayer, she leads us along the road to Jesus, because loving Mary means praising and serving her Son. The rosary is a fine example of this fact. Like a pilgrimage, praying on each bead takes us one step closer to the Trinity. The prayers and mysteries of the rosary are based on Scripture and celebrate God’s gift of Jesus to the world. If you never prayed the rosary, haven’t prayed it in a while, or have had trouble understanding it, The Rosary Prayer by Prayer will clearly lead you through it in a stress-less way. One of the best Rosary Books ever! Even before I joined the Catholic Church I felt a strong pull towards the Rosary. Over the years I have purchased numerous books about the Rosary. Most of them have been great books. In my opinion, The Rosary Prayer by Prayer is the best book for novices, and experienced persons alike. Since it is Gospel based, it is a great inspirational resource for non Catholics as well. It is an excellent imagery and meditative resource. I have bought several copies as gifts to others (Catholics and non Catholics), and they were very pleased. I cannot say enough about The Rosary Prayer by Prayer, so I'll end by saying that if you purchase it, you will not be disappointed! A book, which is well written for those beginning their journey in learning to pray the rosary. It is also a great read for those of us with desire for the inspiration to be reintroduced in our devotion to Mary. Each mystery has a thought provoking reflection and there are many excellent drawings that capture the essence of the mysteries. A well researched book that is well written and a joy to read. This book will make a great gift for family and friends. I grew up Catholic, but didn't know that there were multiple devotions to saying the rosary. And, as an adult and lapsed Catholic I was a bit fuzzy on the basics as well. This book does a soulful job of detailing the steps and introducing the special devotions of each of the mysteries. The pen and inks are a beautiful accompaniment to the text. A very nice gift book for anyone who wants to reaquaint themselves with the devotion of the rosary. The Rosary, Prayer by Prayer will help you learn how to pray the rosary. This beautifully illustrated book is what every person who knows how to pray the rosary or would like to learn needs. The text is wonderfully written with explainations of prayers and Christian timelines in history that offer insight into these prayers. The illustrations are an added bonus and inpsire the reader to really focus on the prayers they are saying. This is a book that should be shared with friends, who like yourself may need refreshment of prayer or first time teaching of how to pray the rosary. As Catholics it is assumed that we were taught this in school, but if you are around 50 years old you may not have learned how to pray the rosary like I did not. This book will be of great value to you for a lifetime.